And but so as I mentioned in the first part of the Leaving 2008 post, we went out to celebrate the holidays with Ong Ngoai and to put 2008 to rest. We also went to help put Ba Ngoai to rest. Buddhist tradition (or at least its Vietnamese inflection, as far as I know) requires that a deceased person's ashes stay in temple for 49 days. After that time, family and friends pay final respects in a ceremony at the temple, and then the ashes can be released from there and wherever. Ba Ngoai's 49th-day service was at a lovely temple a little over an hour away from the house she shared with Ong Ngoai. Much like the other services, there was a lavish altar with her picture (from her daughter's recent wedding) ringed with fruit and flowers that Ong Ngoai bought in the dark hours of that morning. The altar sat at the end of a long red carpet hemmed in gold, and visitors, after leaving their shoes at the door, could take up a chair on either side of it or kneel on it directly. Nearly all the big family had been out for the funeral, but not everyone could make it this time. Ba Ngoai's son was home waiting with his wife and kids for his new daughter to arrive — a girl who'll likely carry Ba Ngoai's name. This time Ong Ngoai, one of Ba Ngoai's sisters (and her two daughters), my wife and her sisters, and Q and The Boy knelt close. 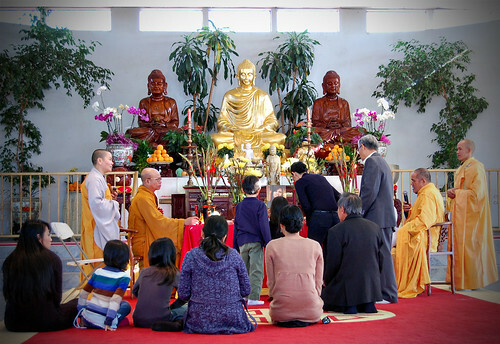 Three enormous Buddhas contemplated everything with closed eyes, the center one a luminous gold. Monks in gold and maroon sang into microphones and softly rung bowls with wooden mallets. Despite the Southern California sun, it was cold. Q and The Boy were outstanding — Q even managed to sit for the entire service, and The Boy nearly so. And when the time came for each member of the family to light incense and pour tea, the kids joined my wife in the ritual. As they waited for the fire to catch, a stitch of sun angled down out of the window and sewed them to the moment. After the ceremony and the songs and the pictures and the bathroom, we left the temple for a nearby beach. We went there in part because of a joke. When talk of what to do with your body was only hypothetical, Ba Ngoai said she'd like to be cremated and her ashes dropped into the Pacific Ocean so that she could swim back to Vietnam. "You can't swim," Ong Ngoai reminded her at the time. Everyone laughed. The Pacific coast lacks the angle and anger of the Atlantic. West Coast beaches tend to be gentle and long, the waves cresting far out and then unfurling lazily on the land. There was a stripe of sand made into a mirror by the wet, and Q and The Boy immediately rolled up their pants and walked out onto their reflections. They can't pass up an ocean. It was my wife's idea to use one of Ba Ngoai's handbags with a hole in it for the release, and my wife's younger sister carried it down the steps from the parked cars. "That's not mom," she said with a warm smile. And it wasn't. The hole in the bag worked for a while, but there was a surprising amount of ash, so the three sisters started to let go handfuls until their hands were black. It was finer than the sand. But even in handfuls it wasn't enough, and my sister-in-law took the bag into waves nearly to her waist. After a quick glance around the nearly vacant beach, she let loose the rest. She came hopping out of the surf, the late-afternoon sky over the water bluer than anyone's idea of it. 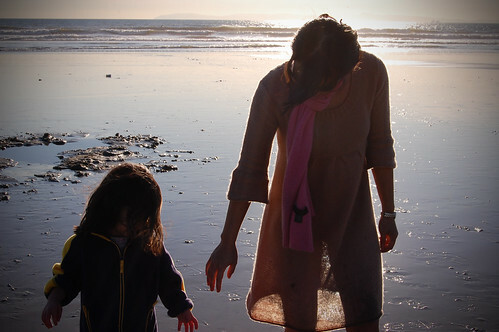 My wife and The Boy then drifted further down the beach together and looked out past everything. Like I said around this time last year, I've abandoned New Year's resolutions and the bullying of the calendar. I have many things that I yet want to do and be, of course, and people I want to see flourish. But I've come to relish much more the moments that select themselves. Like when my sister-in-law walked out of the ocean and back up to us, and Q was there to greet her. They looked to each other and then took hands. That was the end of 2008 for me. Happy 2009, everyone. Now on with living. What a beautiful post! And gorgeous photos as well. I once dated a guy who said that after his death he wanted to be cremated and scattered off the back of the Staten Island Ferry. Somehow that doesn't seem as romantic as the Pacific Ocean.